I want your GTX460 vBIOSes! Thread: I want your GTX460 vBIOSes! Title says it all guys its for my own research purposes, and while I'm at it I'll also upload tweaked versions for people to try out. This is just a rough and quick explanation for people to reference to ensure they have a successful vBIOS flash. Assuming you are going to flash from DOS (safest) and use a USB stick here is a step by step procedure to flashing your vBIOS. Thats it. Ctrl>Alt>Del to restart, run something like GPU-Z to verify the new clock settings and/or voltages and you're done! Last edited by Ket; 09-29-2010 at 11:22 AM. 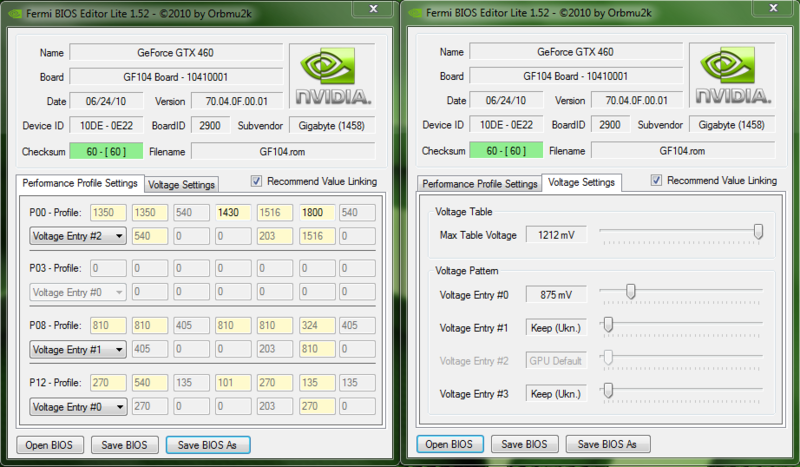 Not just that, I want to collect as many GTX460 vBIOSes as I can as theres not many about. Last edited by Gaul; 12-13-2010 at 11:19 PM. Last edited by [XC] Oj101; 08-02-2010 at 10:14 PM. Zotac GTX460 1GB - reference desing, voltage unlocked. Life sometimes gets in the way of what we want to do. Thanks guys, any and all stock GTX460 vBIOSes are welcome, the more I get, the faster I can build up a GTX460 database for people @ gaul, is your vBIOS 768MB or 1GB? EDIT Does anybody know what the paramater -4 does in nvflash? I keep seeing it in a lot of batch files made by manufacturers but the command itself is undocumented in nvflash. Last edited by Ket; 08-03-2010 at 02:09 AM. Where can I download the Fermi Bios Editor? As quoted by LowRun......"So, we are one week past AMD's worst case scenario for BD's availability but they don't feel like communicating about the delay, I suppose AMD must be removed from the reliable sources list for AMD's products launch dates"
Thanks Ket and Kaktus1907 for unlocking the Bios, but I will wait to flash my card untill the fermi bios editor is available to me or untill a new nvidia bios editor comes out that can read the GTX 460 because i'd like to check the bios myself before flashing. I'd like to mention that my card goes perfectly stable at 820 core in Furmark and Folding@home with the stock Voltage of 0.975 mV. Even with higher voltage(1.081 V) nothing higher is stable and the driver has to restore itself in Furmark and Folding. So i'd really like to try if more Volts will make it reach 850/900 ! measure on the card and you'll see it doesn't work. Hasn't worked for anyone else and when I asked Board Partner they said it can't be done on any reference based card. I can say without doubt 1.1v works on my KFA, temps are higher than with 1.087v by about 5c. 1.15v also works on my KFA, temps are 7-8c higher compared to 1.087v. I'm 99% certain its reference. PCB looks identical to the one Gigabyte, MSI & Co use. virgin palit gtx460 1024mb sonic bios. Last edited by Ket; 08-08-2010 at 02:09 PM.